How do I sign up for BrightPlan? You can sign up for a BrightPlan account here. After providing your name and email, we verify your email address by sending you a set password link. Once you set your password you're ready to start planning by answering a few questions about your financial situation and appetite for risk. Goals in BrightPlan are significant future financial commitments: the milestones you are striving toward like buying a home, traveling, education, or retirement. BrightPlan provides goal planners for each goal type to help you plan, save, invest, and track your progress over time. To help you get and stay on track for your goals, BrightPlan employs financial planning and modeling algorithms to estimate both the future value of your savings and future cost of your goal based on inflation and investment returns projections. When a goal is at risk or off track, BrightPlan will suggest next steps to help bring the goal back on track. What goals can I create in BrightPlan? Custom - Save for a goal of your choice. Goal setting is a key to life and financial success. Research suggests that people can enhance their likelihood of achieving a variety of goals by writing them down and creating a clear actionable plans to accomplish them. Understanding and quantifying your short- and long-term goals is particularly important for financial planning. A goals-based financial plan can help you determine how to prioritize spending and saving, how much to save for various goals, when to invest, how much risk to take in your investments, and what account types to invest within. The BrightSide Blog has a wealth of information about the value of goal setting. We aim to educate you to set and accomplish your most important goals, both for your own financial independence and to leave a legacy that lives on beyond your years. What does BrightPlan do to help me achieve my goals? Every time you create a goal, BrightPlan helps you build a plan one step at a time. The first step is answering, "Why is this goal important to you?" Your mantra serves as a continual reminder that this goal is worthy of your effort, focus, and investment. We help you put a deadline on your goal with a target date, and to put a price tag on it with a target amount. Save for your goal by linking your existing accounts at other institutions, or open a BrightPlan Managed Investment Account and we'll automate saving and investing for you. BrightPlan also suggests monthly or one-time contributions and a goals-based investment plan to apply to your current and future savings. Finally, we work to keep you inspired by allowing you to track progress toward your goals over time. You can see your probability of success change dynamically, track the value of all savings linked to your goal, and view simulations of your progress based on projections of better or worse market conditions. How do I link financial accounts to my goals? BrightPlan supports account linking with over 10,000 financial institutions including banks, credit unions, credit cards, student loan and mortgage providers, and investment accounts. in the financial accounts dashboard. In order to link an account, select "add account" from one of these locations and input the online login credentials for your institution of choice. It may take a minute or two to form a connection and pull the data. Your login credentials give BrightPlan read only access to surface the account's transactions, balances, and performance to give you real-time financial planning insights within the BrightPlan app. BrightPlan does not store the credentials and cannot make transfers into or out of your account. If you close an account you can easily hide or remove it from the app from the financial accounts dashboard. If you prefer not to electronically link your accounts or use a financial institution we do not yet support, manually account tracking is also supported. What does the goal detail page tell me? The status of your goal. On track, at risk, or off track. Our advice if your goal is off track, including additional savings recommendations. Your investment plan. This is our recommended asset allocation of stocks and bonds for your goal and investment profile. Financial accounts linked to this goal. This tab allows you to link and track accounts from external institutions like your bank or 401(k) provider, and to open and monitor a BrightPlan Investment Account to fund your goal. Your goal simulation. We stress test your goal with 1,000 simulations of future market returns for each asset class and inflation outcomes, and present the outcomes in a graph showing the outcome of your goal in better, worse, and average market conditions. How is BrightPlan better than a self service brokerage account? Self-service brokerages are great for individual investors with deep knowledge of investing strategies, a cool head in the face of volatility, or those who want to trade individual stocks. One major downside of self-service brokerages is the lack of personalization for your investing. While there may be tools, charts, graphs, and research reports, there isn't clear, actionable advice for how to combine all of your investments to pursue a particular goal like buying a home. That's why BrightPlan is a better way to invest for your goals. You input your investment objectives, timeframe, and financial resources. Then our software saves you time, energy, and stress by recommending a diversified investment plan to reach your goal, and automating that plan if you choose. No need to pore over research reports or charting software or sift through the thousands of available stocks, mutual funds, and ETFs. BrightPlan does the work for you, so you can focus on what matters: pursuing your goals with a clear plan to reach them. How does BrightPlan keep my information secure? We take security very seriously and have multiple measures in place to keep your account information is safe. Your account is required to have a strong password that must be changed periodically. Your connection to BrightPlan is always protected by SSL Encryption to ensure that all information shared between you and BrightPlan is secure. Sensitive data is encrypted at rest and in transit. BrightPlan has limited access to your financial account information, can only move money at your request, and only between accounts you designate. Moving money between your bank and investment accounts is only handled with your authorization to our independent third-party custodian, TD Ameritrade. All data is stored in Salesforce servers that have met multiple standards for PCI compliance and security. Yes. BrightPlan is a registered investment advisor, regulated by the U.S. Securities and Exchange Commission under the Investment Advisers Act of 1940. 1. Fiduciary duty. As a registered investment advisor BrightPlan has a fiduciary duty to clients. That means we must put client interests above those of the firm, avoiding any conflicts of interest, and providing investment advice with the highest duty of loyalty and care. As the first digital advisor to achieve certification by the Centre for Fiduciary Excellence (CEFEX), BrightPlan adheres to the highest standards to act in your best interests. 2. Clear disclosures. BrightPlan is required to give full and fair disclosure of all material facts when working clients or prospective clients. Rather than leaving you to wonder whether we have hidden conflicts of interest, we are required to disclose potential conflicts of interests and how we work to address them. One way we accomplish this is through delivering and regularly updating the form ADV Part 2. 3. Guidelines. The SEC requires BrightPlan to maintain certain documents including a Code of Ethics, Business Continuity Plan, and books and records of client agreements, marketing documents, financial statements and more. All of these measures are in place to protect investors. A custodian of an investment account handles all of the account administration. Their role includes safeguarding client assets, processing purchases and sales of securities, deducting advisory fees, and delivering account statements. BrightPlan has selected TD Ameritrade Institutional as the third-party custodian for all client accounts. BrightPlan Investment Accounts are opened at TD Ameritrade in the name of the client and managed by BrightPlan as the designated investment advisor. Why does BrightPlan use TD Ameritrade Institutional as a custodian? We chose TD Ameritrade Institutional as the custodian to hold client investment accounts because they are an industry leading custodian. They provide custodial services for over 6,000 registered investment advisors and safeguards over $1.1 trillion in client assets with their asset protection guarantee. Safety of assets was our primary motivator in choosing TD Ameritrade Institutional. TD Ameritrade does not pay BrightPlan any fees for using their service. What is the benefit of linking all my financial accounts to BrightPlan? Linking all of your assets and liabilities to BrightPlan allows you to see an accurate, comprehensive picture of your finances. Every day your account balances, transactions, and holdings will refresh within BrightPlan, keeping this picture up to date. By linking all of your accounts in one place, you no longer need to log in and out of all of your financial service providers to stay on top of your finances. Saving and investment accounts can also be linked to any goal to track your savings automatically. For instance, you could link your 401(k) from work, your partner's IRA, and a joint taxable account to your retirement goal to track all of your retirement savings. While liabilities like credit cards, student loans, or mortgages cannot be linked to a goal, you can view them on the financial accounts dashboard to track your net worth and cash flow. Can I use BrightPlan for financial planning without investing? Yes! Unlike many other digital advisors, you do not need to invest with BrightPlan to benefit from our financial planning advice. As a planning only client you can still create financial goals, link unlimited external financial accounts, track your net worth and cash flow, read our educational content, apply the investment plan we recommend to your other investment accounts, and simulate your financial future. All without investing a dime. If at any point you want BrightPlan to manage your investments you can open a BrightPlan Investment Account to automate investing for your goals. What are the benefits of opening a BrightPlan Investment Account? BrightPlan Investment Accounts make it easier than ever to save and invest for your goals. You can open an account for each of your goals, and rest easy knowing your investment plan is aligned to your tolerance for risk, your resources, and your timeframe. Fund Selection: Choosing investments can be overwhelming and complicated. We analyze and select best-in-class investments to fill your portfolio. Investment Management: You manage your goal, we manage investment and account administration. Sit back and relax, let us do the work. Savings Simplified: Your plan on auto-pilot. Set up one-time or recurring contributions, we’ll invest them automatically. Automatic Rebalancing: If market movements push your portfolio out of balance, our software will automatically nudge it back on track. Strategic Dividend Reinvestment: We minimize the need to sell funds by reinvesting dividends to rebalance your account. Tax Mitigation Strategies: Our tax-aware portfolio construction and periodic tax loss harvesting work to improve your after-tax returns (the only returns that matter). What is BrightPlan's investment philosophy? An investment philosophy is essential for guiding your thinking and decision making. Rooting this investment philosophy in research and evidence makes it easier to stick with and replicate over the long-term. The BrightPlan Investment Committee, led by Co-Chief Investment Officers Jeff Buckner and Peter Lazaroff, has decades of experience managing investments for clients at Plancorp and currently oversee more than $4 billion in investments. Risk and return are related. The compensation for taking on increased levels of risk is the potential to earn greater returns. There are no free lunches in the market. Going after higher returns means taking on more risk. Comprehensive, global asset allocation can neutralize the risks specific to individual securities. Most investors are neither diversified enough, nor properly diversified. BrightPlan portfolios diversify across thousands of stocks and bonds from around the world. Rather than trying to predict market movements, which is an extremely low probability endeavor, your time is much better spent making sure you’ve got the right mix of stocks, bonds and cash in your portfolio for your unique goals. That's why we provide an investment plan for each of your goals. One of the few things in the investment process you have control over is costs. We invest in mutual funds and ETFs with low expense ratios and low turnover, which keeps more of your dollars working toward your goals. In the investment business, you end up getting what you don’t pay for. For a broad overview of the BrightPlan investment philosophy and the research behind it, read our series on Evidence Based Investing. What types of investment accounts can I open in BrightPlan? How do I open a BrightPlan Investment Account? 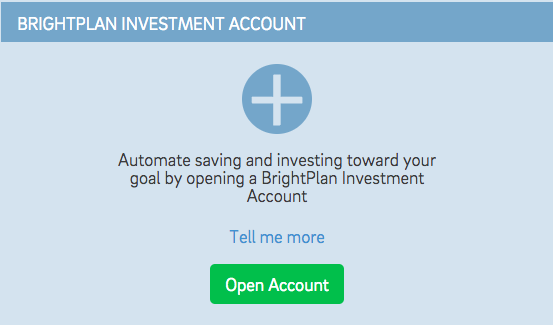 After creating a goal you can scroll down to the “BrightPlan Investment Account” section of the Goal Detail page and click “Open Account” to open an investment account. An investment portfolio is all of the assets held by a person or institution. Portfolios often include the three major asset classes of stocks, bonds, and cash. Having a diverse mix of investments in your portfolio can provide protection against "having all of your eggs in one basket." What are the portfolios offered by BrightPlan and what research are they based on? BrightPlan model portfolios include a mix of stocks, bonds, real estate (REITs), and cash. BrightPlan provides diversified portfolios by investing in mutual funds from Vanguard and Dimensional Fund Advisors. These low-cost diversified funds hold thousands of stocks or bonds from all around the world. The model portfolios range between 80% stocks and 20% bonds (aggressive) and 100% bonds (conservative). The specific mix for each model portfolio, also called the asset allocation, is determined by the BrightPlan Investment Committee, and based on the Nobel-Prize winning research of Modern Portfolio Theory. What is rebalancing and why is it important? Regular rebalancing is an easy strategy to stick to your investment plan. As time passes your portfolio will grow irregularlyand drift from the recommended asset allocation. Rebalancing brings it back on track. For example, a run-up in U.S. Stocks could push your portfolio from a 60% stocks and 40% bonds to 70% stocks and 30% bonds. Increasing bonds in the portfolio or decreasing stocks will regain balance. Rebalancing could be accomplished by investing new contributions only into bonds until the account regained the 60/40 mix, or selling some of the stock position to buy more bonds. Rebalancing is important because when you drift from your plan your risk and return profile changes. Depending on what the market does, a failure to rebalance can mean either taking too much risk for your goal, or too little. Either extreme can put your goals in jeopardy. Are BrightPlan Investment Accounts covered by FDIC or SIPC insurance? BrightPlan Investment Accounts are opened at TD Ameritrade. Cash in these accounts is held in money market funds insured by the Federal Deposit Insurance Corporation (FDIC) and mutual fund investments are protected by Securities Investor Protection Corporation (SIPC) insurance. FDIC Insurance covers up to $250,000 in cash deposits against the failure of a bank. FDIC insurance protects depositors from the risk of bank failure and makes the banking industry safer for consumers. In general, we keep cash in investment accounts to a minimum, (about 0.5% of your account balance), to minimize cash drag. However, if you are saving for a very short term goal we advise keeping your money in cash. SIPC Insurance protects investors accounts in the event of a brokerage company failure. Accounts are insured up to $500,000 per account. If a brokerage is closed due to a bankruptcy or other reason and investor’s securities are missing, the SIPC steps in to return these assets. All stock or bond mutual funds in a BrightPlan Investment Account (the other 99.5% of your account balance) is covered by SIPC insurance. Additionally, TD Ameritrade provides each client $149.5 million worth of protection for securities and $2 million of protection for cash through supplemental coverage provided by London insurers. Note: SiPC and FDIC insurance do not protect your account against the risk of loss due to market movements that comes with any type of investing. Yes, like all investments in the stock or bond markets, your investments carry risk of loss when prices of the securities in these markets drop. This is why for both your emergency fund and for very short-term goals, we recommend a very conservative portfolio of cash or cash-equivalents. For longer term goals, we will suggest taking on market risk for the potential of greater returns. Always remember that risk and return are closely related. In order to generate returns on their money investors take on the risk of loss. This means the potential for losses of your investment principle. You should only invest in the plan we recommend if you feel comfortable with the potential downside risk of investing and you are prepared to hold your investments for the time period you provided when creating your goal. How do I see my portfolio? When you link all of your investment accounts to BrightPlan you can get a birds-eye view of your entire investment portfolio across all of your accounts, or drill down on individual accounts to view the asset allocation or account holdings. Click on the "Investments" tab in the Financial Accounts Dashboard to see your portfolio in one account or across all of your investment accounts. What are the fees to use BrightPlan? BrightPlan charges two possible fees, a financial planning fee and an investment management fee. The planning fee is $20 per month for all clients to use the financial planning tools, paid by credit or debit card. For clients who choose to invest with BrightPlan, the investment management fee is 0.4% annually. Learn more at our pricing page. Is there a fee for withdrawing money from a BrightPlan Investment Account? Nope. It is free to transfer money between a BrightPlan Investment Account and your bank. Where can I see the fees paid in my BrightPlan Investment Account? You can see fees in your BrightPlan Investment Account by clicking on the account in BrightPlan or reviewing your quarterly statements from TD Ameritrade. These fees include the asset based custodial fee of 0.08% annually paid TD Ameritrade. This fee covers all costs for account maintenance and trading. BrightPlan charges a 0.4% annual management fee. How do I make a deposit into my BrightPlan Investment Account? As part of the account opening process you can elect to make one-time and monthly deposits into your BrightPlan Investment Account. Afterward, you can schedule additional monthly, annual, or one time deposits any time from your BrightPlan Investment Account summary page or from the goal detail page. Once a deposit is scheduled you can edit or delete it as long as the transfer is not currently processing. Once a payment begins processing, the payment instruction will be temporarily locked to avoid conflicting information entering the system. After the payment processes, the instruction will unlock and become editable once again. Can I set up a regular savings plan for each of my goals? Yes, you can set up multiple monthly and annual savings toward your goals in a BrightPlan Investment Account. For instance, you could set up monthly deposits to your retirement goal on the first and fifteenth of every month, with an additional annual contribution every January 1st to start the year strong. How do I change or remove the bank account linked to my BrightPlan Investment Account? Click on your name in the top right of the application to go to your profile. Navigate to the section titled "Bank Account Information" and click on "change bank account." We will take you through the steps to change the bank account linked to your BrightPlan Investment Account. This change will require signatures in order to be processed. Any payments currently being processed will be withdrawn from the current bank account, while any payment that has not yet been processed will be held back and processed when a new bank account is linked. Can I transfer my existing brokerage account to BrightPlan? Yes. Our Client Service team will be happy to help you do this by working with you to ensure the right paperwork is completed and signed. Please use the Contact Us form within the BrightPlan application in order to request a transfer. Can I take a monthly or quarterly income from my BrightPlan accounts? Yes. You can file a withdrawal request at any time from within your BrightPlan Investment Account. We will rebalance your account to reserve the right amount of cash in your account by strategically selling securities. Once the cash has been generated it will be transferred to your bank account. The process takes about 3 days. How does your retirement planner work? 1. How much retirement income do you require from your plan? BrightPlan will suggestsnumbers based on your current earnings and a desired lifestyle. All inputs are in today's money. You don't have to worry about how inflation will change your income needs in the future. We will adjust the amounts for inflation. 2. When do you want to retire? This tells BrightPlan how long you will be saving for and how long your savings need to last. We assume a lifespan of 90 years. 3. How much have you already saved? Here you should add up all your 401K, 403B, IRA, Roth IRA and taxable savings accounts. Later you will be able to link these accounts to the goal so BrightPlan an monitor the balances and automatically update your goal and recaluculate the probability of success. 4. How much will you save for retirement? BrightPlan needs to know how much you will save towards retirement across all your retirement accounts, including any additional savings you plan to make. BrightPlan then analyzes your goal, including data about you and comes up with a suggested Investment Plan for your retirement goal. We then stress test your goal by using a Monte Carlo simulation to run 1,000 simulations of your goal. Each test uses different projected market conditions, long and short-term capital gains, and inflation adjustments. This test allows BrightPlan to calculate your probability of success and helps you see how different market conditions could impact your plan. After the initial analysis, you can improve your goal by modeling other expected incomes or contributions. For example, you can factor in social security, income from a part time job, a windfall from the proceeds of selling a home and downsizing, or any other income event relevant to your retirement. BrightPlan will then re-analyse your goal to take these additional factors into account. What assumptions are used in the retirement goal simulation? To calculate your probability of success we make a few assumptions in the retirement goal planner. Your target annual retirement income will increase each year by the inflation estimate at the bottom of the goal. Your contributions and savings will also increase by this inflation amount. The asset allocation for all linked retirement accounts is the same as the investment plan for your goal. The portfolio will deliver similar average returns and volatility as a representative index portfolio has over the past 27 years. Capital gains are taxed at a 28% rate for short term gains and a 15% rate for long term gains. How do I edit a goal? After creating a goal, you can edit the goal parameters on the panels within the goal detail page. Tap the pencil icon adjacent to your goal status (e.g. "On Track") to edit your target date or amount. You can update planned contributions to your goal from the pencil icon on the "External Contributions and Income" or "BrightPlan Deposits" panels. How do I add a beneficiary to my BrightPlan Investment Account? Contact customer service through the Contact Us page within the BrightPlan application to specify your account beneficiaries. We will send you necessary paperwork to review and sign. Why does one of my linked financial accounts show, "Account Closed" when it is not closed? Our aggregation vendor, Yodlee, has integrations with over 10,000 institutions. From time to time, a vendor changes the integration with Yodlee and Yodlee is unable to refresh the data for an account. Yodlee assumes that the account is closed when it repeatedly to connect to your account. Linking the account again should fix the issue by forcing a refresh of your account. You may notice a different designation for your accounts when you relink them. That is expected if the Vendor has changed the way they share data with Yodlee. The primary reason for connectivity issues is linked accounts with two-factor authentication enabled. When you link the account initially we use a token from your bank or investment institution to connect the account, but that token expires. When the account linking token expires you will be asked to re-enter your second factor for the account (usually getting a code sent to you by text or email). Tap the "Unable to Connect. Fix" prompt to go through this process. The frequency of this activity depends on the policy at your bank or financial institution. You may be required to enter the second factor every time you sign into BrightPlan or it may be as infrequent as monthly.